CEDAR CITY — Southern Utah University’s Department of Theatre Arts & Dance will perform the musical “Assassins” beginning Friday in the Eileen and Allen Anes Studio Theatre in Cedar City. Assassins will be performed Nov. 3, 4, 6, and 10 at 7:30 p.m. and Nov. 11 at 2 p.m. and 7:30 p.m. in the Anes Studio Theatre located in The Beverley Taylor Sorenson Center for the Arts at 195 W. Center St. The musical takes a look into the twisted minds of historical figures and contains adult content and strong language, recommended for mature audiences only. 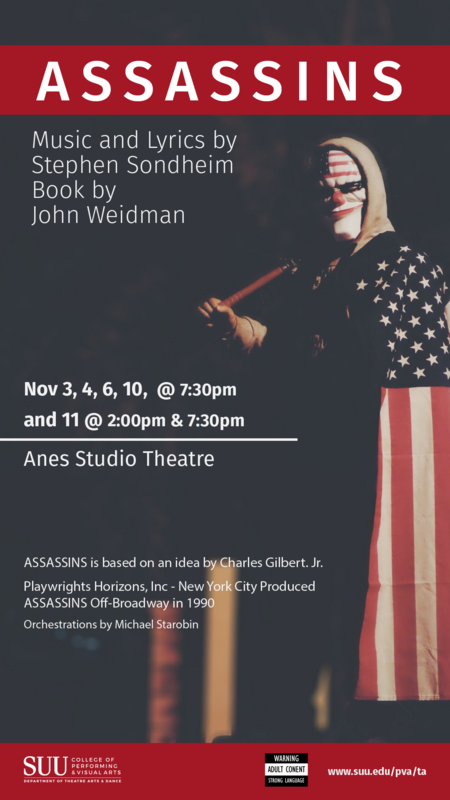 Assassins, written by Stephen Sondheim and John Weidman, brings together the individuals that assassinated or attempted to assassinate former presidents of the United States. It digs into the minds of these people and explores the reasoning behind their actions. While every nation has its assassins and would-be assassins, only in America, the authors suggest, do disturbed and disturbing individuals act not because they hope to influence national politics, but because they are wrapped up in a malignant sense of entitlement. Feeling betrayed by the failed promise of American democracy and the American Dream, they strike out at the symbol for America: the American President. Assassins spans several musical styles and many decades in a dizzying series of musical and theatrical inventions that culminate in the assassination of John F. Kennedy. Due to the sensitive content of this production, the university’s Theatre Arts & Dance department offers three pre-show talks prior to the performances on Nov. 3, 10 and 11. The talks will be held at 6:30 p.m. in the Garth and Jerri Frehner Rehearsal/Education Hall, also located in The Beverley. The talks will feature faculty from the university’s history department presenting history behind the events portrayed in the musical. Among them, Dr. Laura Davis, assistant professor, Dr. Earl Mulderink, professor, and Dr. Michelle Orihel, associate professor. When: Nov. 3, 4, 6 and 10, 2017, at 7:30 p.m., Nov. 11 at 2 p.m. and 7:30 p.m.
Tickets may be obtained at the SUU Centrum Ticket Office 435-586-7872 Monday-Friday from 8 a.m.-4:30 p.m. or online. Tickets are $15 for adults, $12 for alumni with an alumni card and $7 for high school students. Admission is free for SUU faculty, staff and students with a valid ID card. Faculty and staff IDs are allowed one guest. Who are the assassins in history that you will be portraying, since you show someone with an American flag draped over them? Hopefully not American presidents or our founders, as that would be over-the-top, and un-American.